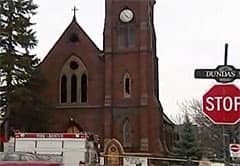 It looks like the historic All Saints Church in Whitby will be saved despite the devastating fire eleven days ago. Recent reports are that the walls and steeple are stable. The salvageable stained glass has been removed and preparations are being made to cover the roof that was destroyed with a temporary structure. Last night’s news stated they’d like to be back by Easter, 2011. In the meantime, another local church is providing space to them, and donations covered all of the hampers for the needy that were also lost. Arson is still suspected, but has not been officially confirmed. Here is a nice Flickr set of the church, both before and after.